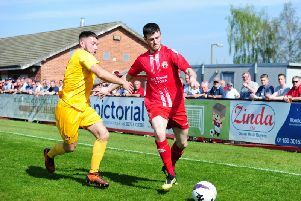 Ilkeston FC were condemned to another season in the Evo-Stik Northern Premier Division by defeat to ten-man Curzon Ashton in the play-off final. Simon Woodford gave the home side a deserved lead on 18 minutes, applying the final touch to a short corner but Ilkeston responded superbly after the break. Despite dominating the second half they were unable to find a way through and were left to rue missed chances as Joe Guest saw red late on for Curzon. Manager Kevin Wilson’s final game in charge ended in disappointment, as Ashton join FC United of Manchester in the National League North. The Robins finished two points behind Curzon this season and suffered a 4-0 defeat in the league fixture at the Tameside Stadium in February. And it was the hosts that made the brighter start, firing several free-kicks into the Ilkeston box with Daniel Shaw seeing an early effort go over. The visitors began to find their rhythm but an incisive Curzon breakaway almost saw Guest open the scoring, his effort hitting the side netting. Ashton took the lead shortly after, Woodford turning in Alex Brown’s cross after a lucky ricochet off Matt Baker gave the midfielder a second opportunity to centre. Despite the Robins moving the ball neatly, the home side remained in control and Ashley Scott’s curling effort forced a smart save from Smith. A reinvigorated Ilkeston came out after the break and Rob Duffy failed to make contact with James Reid’s cross, before a Reid free-kick evaded everyone. Reid was involved in everything good for the visitors and was unfortunate to see his dipping effort go straight at Hakan Burton in the Curzon goal. Jack Lane was next to be denied by Burton, heading straight at the goalkeeper after rising highest to meet David Morgan’s free-kick. Semi-final hero Kane Richards almost found the equaliser, after beating four Curzon defenders with a mazy run from the left he fired over. Guest was sent off in added time for a second bookable offence and Michael Williams thought he had equalised for the visitors but his shot deflected wide. Ilkeston FC: Smith, Rose, Reid, Baker, Maguire (c), Lane, Morgan, Chettle, Duffy, Richards, Bako (Williams). Subs: Watts, Gorman, Wright, Burrows. Curzon Ashton: Burton, Woodford, Thornton, Hunt, Shaw, Brown, Romney, Walker, Souvemanen, Stott, Guest. Subs: Pugh, Bett, Horrocks, Warburton, Mason.